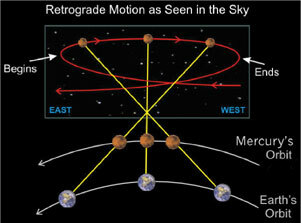 All the planets, except Sun and Moon, have these retrograde periods, but Mercury is most famous for them, probably because Mercury represents our very essential communication abilities. While people speak of Mercury Retrograde periods that screw up computers and television sets, today's astrologers believe the mishaps happen in more personal realms (Uranus is the planet that rules television and computers). Since Mercury rules communication, it's said that everything goes haywire in that area. You could miss appointments, your computer equipment may crash, checks get lost, and you find the car you just purchased during Mercury retrograde is a lemon. Projects will demand more time and money than anticipated during these times. There will be countless delays, cancellations and postponements. All machinery and things with moving parts--such as computers, VCRs, camera equipment, garbage disposals, and so forth, will reveal any weak links now. It's typically not considered a time not to make any important decisions or start anything new. Avoid signing any new contracts, including buying a house, car, or work related projects. Though Mercury retrograde may be viewed as a negative aspect, we have to realize in order to move forward it's sometimes necessary to backtrack and reconfigure our paths in life. It actually gives us an opportunity to catch up with ourselves, and to look back. Something from the past might return in a different form. This can mean people, ideas or buried insights that need to surface for you to move forward. Often it's felt as a contemplative time, depending on the sign, a chance to go over old ground again, to claim what you missed the first time. Mercury forces us to slow down and fix what's broken, and in so doing, rethink things. It also gives us time to get to projects we have put on the back-burner. Know that these 'inconveniences' will benefit you in the long run. Don't fight them, although your frustration level and feeling of restlessness will be hard to cope with at times. Don't forget that Mercury is the Trickster who brings messages and learning lessons in round-a-bout ways that we attract by synchronicity. Visit Our ASTROLOGY CENTER to Learn More! !